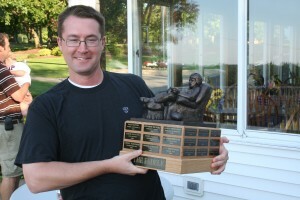 The idea to sculpt a perpetual fantasy football trophy first came to me as an undergrad at Kent State University. The year was 1993 and I was an art major taking a bunch of figure drawing, painting and sculpture classes. I was also the commissioner of a fantasy football league that began in 1991 with a group of friends from high school. I knew that playing for more than just the cash prize would add a ton of excitement to our league so I went to the sculpture department and grabbed a sack full of clay and started sculpting. My very first sculpture was pretty crude and I didn’t even use a model. The figure I developed was primarily based on a lot of drawings and anatomy studies I did in my other classes. I just knew that I didn’t want it to be too polished and slick. Instead I strived to make it similar to the feel of the Heisman trophy with it’s somewhat clumsiness of mark making and texture. When the modeling of the clay was complete I cast it in plaster and then painted it to look like bronze. The base was thrown together with a couple of spare 1 x 8 pieces of pine my Dad had in his garage. What a piece of crap it turned out to be. It didn’t matter though. My buddies went crazy when I unveiled it at the draft that year and because of their response I decided to start a new and better trophy. That trophy turned out to be the current Armchair Quarterback with a large base. This time though I asked my cousin Johnny to model and I cast the sculpture in resin. I also matched the look of bronze more accurately and had my Uncle Joe make the base out of solid oak. About a year later FantasyTrophies.com would be born. My league is now in it’s 22nd year and our “Fedele Trophy” still sits proudly at each and every draft. Some guys have yet to have their name on it while others, like myself, have won it numerous times (three to be exact). We pass it from champion to champion and can see the history of our league engraved on each and every plate. As for that original piece of crap- it now resides in my Dad’s yard as ash and smashed plaster after I burned it in his burn pit. It’s spirit though lives on in all the other trophies that have come after it- including the one my league plays for.